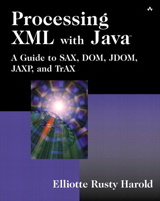 Processing XML with Java provides a brief review of XML fundamentals, including XML syntax; DTDs, schemas, and validity; stylesheets; and the XML protocols XML-RPC, SOAP, and RSS. The core of the book comprises in-depth discussions on the key XML APIs Java programmers must use to create and manipulate XML files with Java. These include the Simple API for XML (SAX), the Document Object Model (DOM), and JDOM (a Java native API). In addition, the book covers many useful supplements to these core APIs, including XPath, XSLT, TrAX, and JAXP. Elliotte Rusty Harold is an internationally respected writer, programmer, and educator. He is an Adjunct Professor of Computer Science at Polytechnic University in Brooklyn, where he lectures on Java and object-oriented programming. He started by writing FAQ lists for the Macintosh newsgroups on Usenet, and has since branched out into books, web sites, and newsletters. He's currently fascinated by Java, which is beginning to consume his life. His Cafe Au Lait web site is a frequently visited Java site. Elliotte resides in New York City with his wife Beth and cat Possum. When not writing about Java, he enjoys genealogy, mathematics, and quantum mechanics, and has been known to try to incorporate these subjects into his computer books.